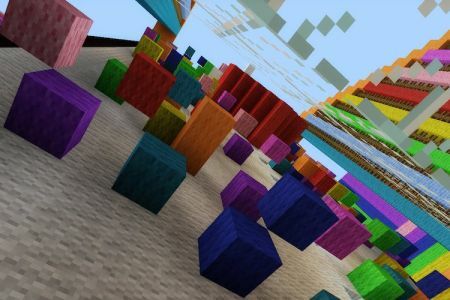 A Minecraft climbing wall is a great idea. I made mine extra colourful and put fireworks to be set off once you arrive at the top. Check out my pic and vid for inspiration to make your own. 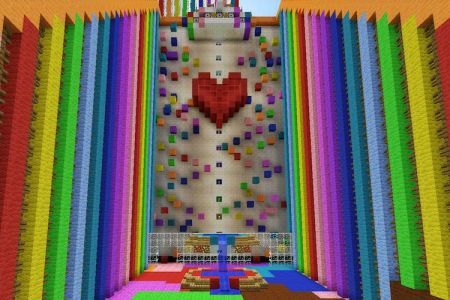 The Minecraft Climbing Wall is an epic climbing wall that is super easy to recreate and fun to look at it. 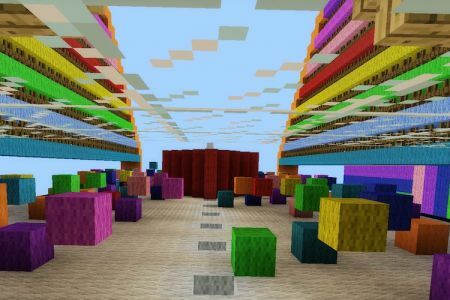 I obviously used a lot of colourful wool blocks when making this ride. 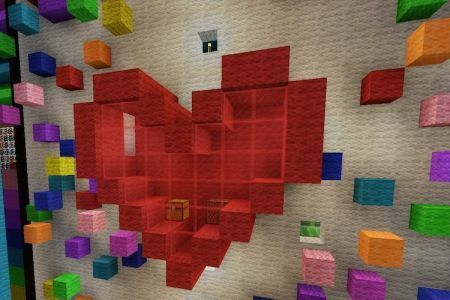 I made it in creative which is much easier than attempting to do it in survival, but if you have the wool blocks, by all means go ahead. 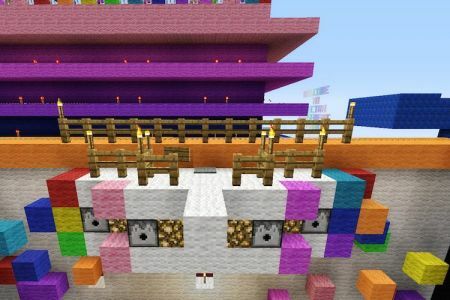 To make this even more fun you could use slime blocks instead of wool blocks giving you an extra bounce to deal with. It might look relatively easy but its actually a bit challenging, as tension rises as you get nearer to the top. 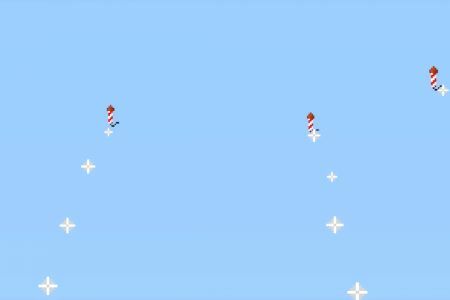 Its probably the worst when your so close and then accidentally miss a jump and plummet to the bottom. To recreate this I recommend starting with the back drop first. I made the white wall as high and wide as I expected the ride to go. When I finished, then I started to create the actual climb. I find it easier to work with a “base” or a “template” and then fill in from there. Maybe you will find that you like to create it all as you go. Either way I simply used glass to enclose the starting area, I didn’t make it very official or anything, where you start. Since my climbing wall is so out in the open that works for me. I think it wouldn’t have looked as good had I not used glass blocks to enclose the bottom starting area. It would have looked out of place. As you can see from my photos and vids, I think it looks quite awesome. Now when your placing the blocks for the climb you will want to place them relatively close together, but not to close. It should be challenging but you could mix it up a bit and add some that are a little further away. You don’t want your rides to be to frustrating that people give up attempting them, but not to easy either. So switch it up! and on the more difficult jumps make sure there is a block not far below in case you do fall. That way you aren’t starting right from the beginning again. 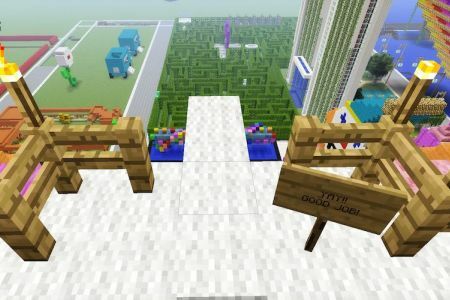 Of course to end any epic Minecraft climbing wall you’ll need a great reward at the top. 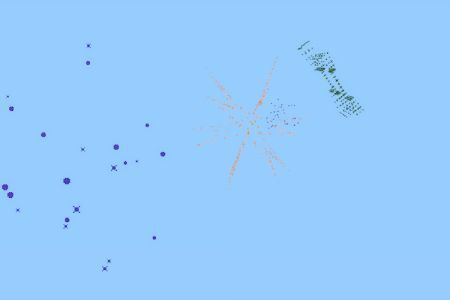 Minecraft makes that easy by providing fireworks, and so when you reach the top you set off a firework display. I personally love that! Its one of my favourite aspects to this ride and my park. 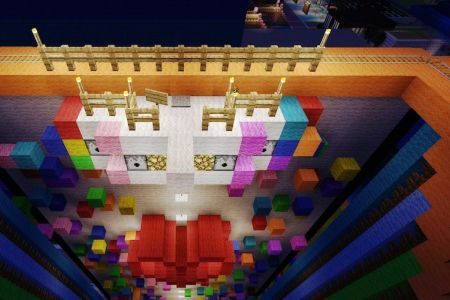 An amusement park definitely needs fireworks and it just seemed like the perfect fit, to have that as a reward for finish the Minecraft climbing wall. To exit I simply put a “diving board” at the top where you jump off and land in a pool of water at the bottom. I find that the most fun, and I believe you survive whether your in creative or survival when you jump from any height into water. So basically, perfect! However you can always use a rail, latters, etc to get down.